The Toasted Drive is a transparent, low-to-medium gain overdrive pedal. Unlike myriad Tube Screamer or Klon clones out there, which use opamps and clipping diodes, the magic in a Toasted Drive comes from the natural overdrive of MOSFET gain stages set up like tube gain stages in an amplifier. The Toasted Drive's elegant circuit achieves amp-like overdrive through the fairly straightforward mechanism of being an overdriven amp in a small, boutique pedal. The Temperature knob sets the gain of the first amplification stage, controlling the amount of distortion generated in the pedal itself. 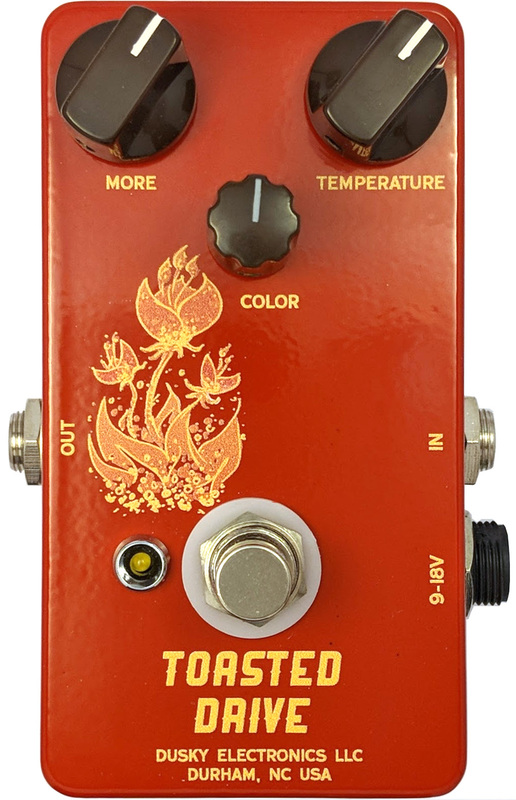 On lower temperature settings, the Toasted Drive pedal can be used as a transparent clean-ish boost with a hint of dirt, depending on how hot your guitar's pickups are. At the maximum setting, you can get a classic ‘60s or ‘70s roar, like you just took an old tube amp and dimed the volume. The More knob controls output volume. Unity gain will usually be found around 11:00 or 12:00 on this knob, with higher settings easily pushing the input of most tube amps into natural tube overdrive. The Color knob adds more gain just in the treble frequencies you need to cut through a band mix and be heard while staying musical—never harsh or thin.